The perfect way to relax in the hot summer months is by taking a swim in a cool place. What’s better than that is if it’s your own pool. Hiring a company to do it all for you can be costly. Save money and time by following our 12 steps to pool building success! Finding something you already like and getting it down on paper. Or imagining your own perfect pool project. You can gather inspiration from magazines or books dedicated to pool design. No doubt the easiest step in the process! 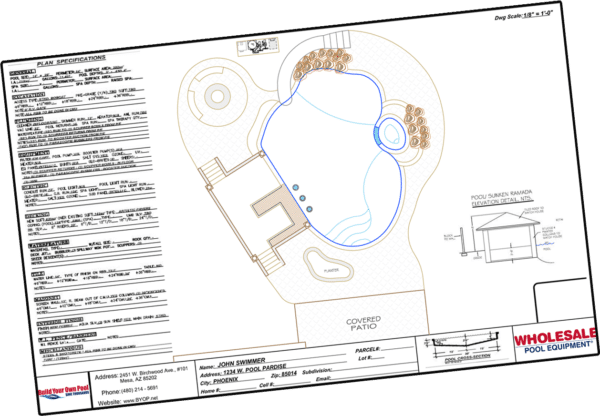 After all the work put in to designing the pool, now is the time to see it in life scale by painting your pool design on the ground. Once it’s painted, take it all in. Live with it for a day or two. If there are any changes to be made, now is the time to do it. Digging out that pool is no small task. Allow a day or two depending on how complicated your design is. You’ll be able to see the final depth, steps, ledges, everything! Pool filtration, cleaning, chlorination, heating, spa jets, drains and returns all get put in at this point in the process. Unless you want to swim in the dark, electrical wiring is another important step. Lighting, equipment area and working plumbing are some of the things wiring your pool are used for. Setting up the frame for the shotcrete to be laid. This gives the shotcrete extra stability and structure to lay on. During this step, floor and wall are covered in 8 inch thick shotcrete. Shotcrete sounds complicated, but is just concrete forced through a hose and nozzle at high speeds. This enables the concrete to be “shot” on vertical walls or non-structural components of the pool. 3 inches above and 3 inches below the water line is where most tiling will go. Not only does it act as an accent to your overall pool design, it saves you cost on maintenance. Without tiles discoloration due to treated water will occur where the above and below water concrete meet. Tile eliminate this worry. Stone, tile, plaster, pebbles… A one or two day process depending on what you choose. There is no water in the pool, that’s the interior finish!